The desert tortoise (Gopherus agassizii) is one of four tortoises endemic to North America. The other three endemic species are the gopher tortoise (G. polyphermus), the Berlandier's tortoise (G. berlandieri), and the Bolson tortoise (G. flavomarginatus). The natural range of the desert tortoise encompasses both the Sonoran and Mojave deserts of the southwestern United States, and includes parts of Arizona, California, Nevada, Utah, and Mexico (Fig. 1). There are two genetically distinct populations of the desert tortoise; Sonoran tortoises are found south and east of the Colorado River, while Mojave tortoises are found north and west of the Colorado (USFWS, 1989). Desert tortoises have a highly domed, distinctly ridged carapace ranging in length from 8 to 15 inches (20 to 38 cm). The carapace is brown or horn colored while the plastron is yellow hued and without a hinge. Male tortoises have extended gular shields used in combat with other males during the breeding season (Stebbins, 1985). Both sexes have stout, elephant-like limbs with allows these reptiles access to an amazing range of microhabitats, from shallow desert washes to extremely steep mountainous slopes. Like many desert reptiles, desert tortoises thermoregulate by moving between areas that provide a wide range of temperatures such as open ground, temporary rest areas, and permanent sheltersites. Desert tortoise activity at any time of the year is driven by temperature and forage availability. During the spring months (March to May), temperatures and forage availability are the most favorable, and desert tortoises spend a significant portion of their day foraging and searching for mates. As temperatures rise with the onset of the summer months (June to late July), desert tortoises begin to aestivate; spending more and more time inactive underground in sheltersites. In the Sonoran desert, summer monsoon rains during the months of July to October bring the tortoises out of aestivation to build up their energy reserves before winter hibernation. Mojave tortoises do not have access to the summer monsoon and mainly feed in the spring. 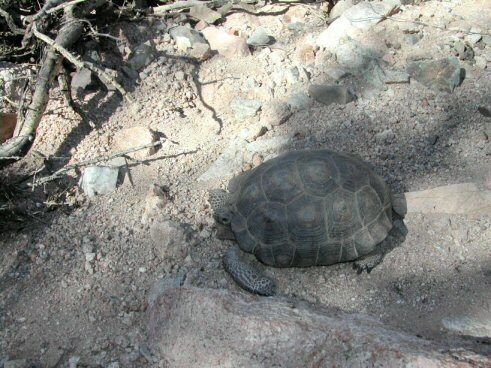 When temperatures begin to decrease in the late fall and winter months (October to February), desert tortoises hibernate in sheltersites until spring. The decline of desert tortoise populations in the last few decades spurred the emergency listing of the desert tortoise as an endangered species on August 4, 1989. The final ruling however, listed the Mojave population as threatened on April 2, 1990 (USFWS, 1990). There are many causes contributing to the population decline of the desert tortoise such as collection of tortoises for pets, raven predation of eggs and juveniles, habitat disturbance and loss, and the spread of chronic upper respiratory tract disease (URTD) (Luckenbach, 1982). Although a combination of the above factors has lead to population declines of the desert tortoise, two causes outweigh the others in both severity and impact. As with many other threatened or endangered reptiles, the largest threat facing desert tortoise populations today is habitat disturbance and loss. Land development over the natural range of the desert tortoise has not only resulted in the direct removal of habitat, but has also resulted in increased on and off-road vehicular activity, and livestock grazing. Increased vehicular activity increases the numbers of tortoises killed while attempting to cross roads, and is a significant cause of tortoise mortality (Berry, 1984). Off-road vehicle usage and livestock grazing have made the way for the introduction and spread of non-native plants. When habitat is disturbed, invasive, non-native plants can outcompete native plants causing a shift in the vegetational ecology of an area. Jacobson (et al., 1991) suggested that desert tortoises depend upon the superior nutrition they receive from a diet composed of native vegetation to maintain their health and resistance to disease. The other major threat facing desert tortoises is the incidence and spread of upper respiratory tract disease (URTD). Over the last ten years, URTD has spread into wild populations of desert tortoises with devastating effects. Although the mortality rate of URTD is not as high as researchers once feared it would be, it is, and will continue to be, a significant cause of desert tortoise mortality. Researchers have found that the pathogenic agents responsible for this disease can occur naturally in the respiratory tracts of healthy desert tortoises with no apparent ill effects. It is currently believed that stress, caused by such factors as overcrowding, poor diet, or incorrect environmental conditions increases a tortoise's susceptibility to URTD (Brown et al., 1992). Any tortoise that is subject to stress can develop or carry URTD, therefore, it is imperative that captive desert tortoises are NEVER released back into the wild, as they may carry URTD which could possibly infect healthy wild populations. It is also inadvisable to keep desert tortoises in inappropriate habitats, and therefore captive desert tortoises should only be kept by individuals residing in or close to the natural range of the desert tortoise. Desert tortoises are protected both at federal and state levels. As a consequence of this, it is illegal to collect desert tortoises from the wild without a permit from both the federal government and the states of California, Nevada, Utah or Arizona. It is illegal to buy or sell desert tortoises, regardless of their point of origin. The only legal way for the average individual to acquire a desert tortoise is to adopt one from a State Game and Fish sanctioned organization or to receive a captive born hatchling as a gift. Information about desert tortoise adoption programs is readily available from the State Game and Fish departments, herpetological societies, and turtle and tortoise clubs located in the states within the natural range of the desert tortoise. Adult desert tortoises do best outside in backyards that closely simulate their desert habitat. Before adopting a tortoise it is wise to keep in mind that a backyard fence is necessary, both to keep the tortoise in, and to keep potential predators such as coyotes and domestic dogs out. Desert tortoises are expert diggers, so it is also necessary to sink the fence post at least 6 inches (15 cm) into the ground. Unfenced pools will require fencing to prevent the tortoise from accidental drowning. In the wild, it is rare for desert tortoises to encounter large pools of standing water, and subsequently, they are extremely poor swimmers. Outside tortoises must be provided with shaded areas or sections of the yard where they can tunnel into the ground to escape extreme temperatures. One of the best methods of providing shelter is to construct an artificial tortoise den. In an area of your backyard that is free from flooding (preferentially on the side of a slope), dig a tunnel large enough for the tortoise to crawl through, leaving 4 or 5 inches (10 to 12 cm) of clearance on both sides. Fortify the tunnel with support to ensure that it will not collapse and trap the tortoise inside. The length of the shelter should be long enough for the tortoise to move its entire body inside, but not long enough so that the tortoise cannot be retrieved in case of an emergency. The back of the artificial shelter should be wide enough to allow the tortoise to turn itself completely around. Very young tortoises may be kept indoors in enclosures no smaller than a standard 20 gallon (76 liters) long (30 in [76 cm]) aquarium. The indoor set-up for a young desert tortoise is very similar to the set-up used to house other young arid tortoise species such as the leopard (Geochelone pardalis ssp.) and African spur-thighed tortoises (G. sulcata). To set up a young desert tortoise inside you will need a 20 gallon long aquarium or larger enclosure, a screen top to prevent humidity buildup, a heat source at one end of the enclosure, hiding spots at both the warm end of the cage and the cool end, suitable substrate, and a full-spectrum light source that produces wavelengths in the UVB end of the spectrum (290-315 nm). Screen tops are a good choice for desert tortoise housing because it is thought that excessive high humidity can increase the susceptibility of desert tortoises to URTD. There are several different options for heat. Undertank heaters and overhead incandescent light bulbs are both suitable heat sources provided that the temperature is closely monitored to ensure a basking site of 88-95 degrees F (31-35 degrees C). Hiding spots should be placed at both the cool end of the enclosure and the warm end, in order to offer the young tortoise security in a variety of temperatures. Hiding spots can be created out of almost anything, from the aesthetically unappealing, but cheap, used cardboard boxes, to elaborate rock tunnels or cork bark rounds. If hiding spots are created from piled rocks, the rocks should be glued together with epoxy or silicone aquarium sealant to prevent the tortoises from knocking the rocks over and possibly injuring itself. Suitable substrates for desert tortoises include rabbit pellets, alfalfa hay, and natual substrate collected from desert tortoise habitat.. Rabbit pellets have often been used as substrate in arid tortoise terreria, but they do tend to mold easily if wetted and there is always the possibility, albeit somewhat remote, of the tortoise ingesting a large section of alfalfa pellet which may cause intestinal blockage. Alfalfa hay is a good choice, the tortoises will often bury in it and as such, it can double as a hiding spot. Natualistic substrate can be used in a display tank, but watch for foregin materials such as cigarette butts when collecting. A full spectrum fluorescent light source that emits light in the UVB end of the spectrum is recommend for desert tortoises because the vitamin D3 obtained from this source is helpful for the absorption of dietary calcium. It is important to note however, that the benefits of full spectrum lighting are drastically reduced if the tortoise is more than 12 inches (30 cm) away from the source. Full spectrum lights need to be replaced every six months to ensure high UV output (Messonnier, 1995). There is no lighting, however elaborate it may be, that can compete with the benefits of natural, unfiltered sunlight. If possible, take the tortoise outside for some supervised sunshine, but be careful to always offer a shaded area so that the tortoise does not overheat. If a young tortoise is kept inside and not allowed to hibernate, the full spectrum light and heat source should be left on for 10-12 hours daily. If the indoor nighttime temperatures drops below 60 degrees F (15 degrees C), then a nighttime heat source such as an undertank heating pad, dark incandescent heat light, or ceramic heat fixture should be left on to maintain a nighttime warm end temperature of 70-75 degrees F (21-24 degrees C). In the wild, the desert tortoise diet is composed primarily of native desert grasses, forbs, shrubs, and cacti. Natural desert tortoise diets are high in fiber and low in moisture. As with other reptiles, captive diet plays an extremely important role in the health and longevity of captive desert tortoises. Susceptibility to URTD is thought to have a dietary link, and other disorders such as metabolic bone disease and gout are directly related to dietary quality. Desert tortoises kept in large, natural desert backyards are usually capable of finding enough forage for themselves, but it is advisable to provide some supplementation if you are not absolutely sure the tortoise can find enough food on its own. The vast majority of captive desert tortoises are not housed in large, natural desert backyards and will need a balanced diet provided for them. First and foremost, desert tortoises are natural grazers and will taste every plant in a backyard to see if it is to their liking, therefore it is absolutely essential that toxic plants are identified and removed. There are several common landscape plants used across the Southwest that are toxic to tortoises such as oleander (Nerium oleander), lantana (Lantana camara), and bougainvillea (Bougainvillea brasiliensis). If you are not sure whether or not a plant is toxic, ask your veterinarian. It is also important to ensure that no pesticides are used in your yard, as these chemicals can be harmful to tortoises. Most backyards across the Southwest have bermuda grass (Cynadon dactylon) either intentionally or as a weed. Bermuda grass is an excellent forage source for desert tortoises and can compose a majority of their captive diet. As with other captive reptiles, variety is important, so you should offer your tortoise a mixed salad every day in addition to the foods the tortoise consumes on its own. The best tortoise salad is high in fiber and has the correct calcium to phosphorous ratio (2:1) for herbivorous reptiles. For example, a tortoise salad that meets these criteria is as follows: 80-90% dark leafy green vegetables such as collard, mustard, and dandelion greens. Other dark greens such as endive, watercress, and escarole can also be used for variety, but avoid spinach in large amounts. Spinach and beets contain oxalates that bind dietary calcium, making it unavailable to the tortoise. Members of the cabbage family such as cabbage, kale, brussel sprouts, cauliflower, and broccoli should be either fed sparingly or avoided entirely. These vegetables contain iodine binders that can cause an iodine deficiency. 10-20% of the salad should be vegetables and fruits such as grated carrots, squash, and zucchini. Fruits that are very high in water content such as strawberries, melon, and papaya can be offered occasionally, but the emphasis should be on high fiber, high calcium greens and vegetables. Fruits and flowers from the prickly pear cactus (Opuntia ssp.) compose a major portion of wild tortoise diets at certain times of the year and can be added to the captive tortoise diet to improve variety and overall nutritional content. Dry alfalfa hay may also be offered to improve variety. A high quality calcium supplement should be lightly sprinkled over the tortoise salad three times a week for tortoises under five years of age, and twice a week for older tortoises. Individuals with room in their backyards might consider planting a "tortoise garden". To plant a tortoise garden, identify plants that compose some of the natural diet of desert tortoises, and collect their seeds for planting in the backyard. There are many easily identifiable plants that can be collected in the wild and successfully propagated in you yard that are very nutritious for desert tortoises such as tobosa grass (Hilaria mutica), big galleta grass (Hilaria rigida), filaree (Erodium cicutarium), prickly-pear cactus (Opuntia ssp. ), and downy brome (Bromus tectorum). Although desert tortoises receive the majority of their water requirement from the food they consume, they will drink from a bowl of standing water. Provide desert tortoises with the option of drinking from a dish by providing a small, shallow container of clean water. If you are housing a young tortoise inside, offer a shallow container of water on the cool end of the enlcosure to reduce humidity buildup. As the outside daytime high begins to fall to around 70 degrees F (21 degrees C), tortoises will be preparing to go into hibernation. Many people do not hibernate young tortoises until two or three years of age. Although it is natural for even very young tortoises to hibernate, there have been incidents of young tortoise deaths during hibernation. Ill or injured tortoises should not be hibernated because they have compromised immune systems which may be further weakened by cold temperatures. If a tortoise is housed outside and is safe from flooding or freezing in its shelter area, it can be allowed to hibernate on its own, provided that periodic checks are made on its health. If the backyard is not safe enough for hibernation, there are several options. One option involves the construction of a "hibernation box". Take a large cardboard box, with several rows of holes punched in it for ventilation, and fill it with shredded newspaper, alfalfa hay, or screened pine shavings. Stop feeding your tortoise for a week and then place the tortoise inside the box. If the tortoise moves around and protests, wait a few days and try again. When the tortoise settles down and buries into the substrate, it is ready to hibernate. Seal the top of the box with packing or duct tape, and place the box outside in a shaded, protected area or in an unheated room. Wherever the tortoise is placed, the temperature must remain low enough for hibernation, a temperature range of 50 to 60 degrees F (10-15.5 degrees C) is adequate for this purpose. If the temperature is too high, the tortoise will hibernate, but its metabolism will be too high, causing excessive weight loss which may weaken the tortoise and increase its susceptibility to disease. Another option for hibernation involves the construction of an outdoor hibernation pen. In a safe, shaded area of the yard, a pen can be constructed so that when placed inside, the tortoise can completely turn itself around, but it cannot crawl out. Make sure to ventilate the pen by drilling several rows of holes in the sides. Follow the same directions as used for the hibernation box, but be sure to seal the top the pen off with an opaque, ventilated cover such as pegboard or drilled plywood. Hibernation pens are convenient in that they can be used year after year. Hibernation usually lasts from October to March, depending upon environmental conditions. When the outside temperatures begin the reach daily highs of 70 to 75 degrees F (21-24 degrees C), it is time to bring the tortoise out of hibernation. 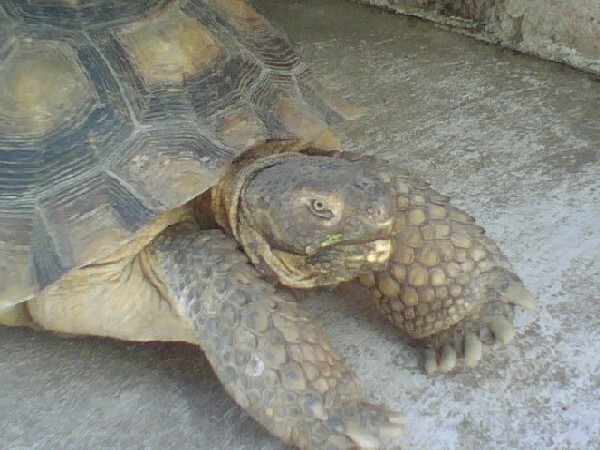 After removing the tortoise from its hibernation area, check it thoroughly for any signs of disease such as inflammation of the eyes or tympanic membrane, mucous or bubbly exudate from the nostrils or mouth, wheezing respiration, and disfigured or swollen jaws. If the tortoise displays any of the above symptoms after coming out of hibernation, take the tortoise to the veterinarian. The best way to find a qualified veterinarian for your tortoise is to join of contact your local turtle or tortoise club or herpetological society. If no such organizations exits in your area, contact the State Game and Fish department and ask the state herpetologist for a reference. If the tortoise appears healthy after hibernation, offer it food and water. Within a few days the tortoise should be roaming around and acting normally. As with many other reptile species, the breeding season follows hibernation. The breeding season for desert tortoises runs from March to May. Some breeding activity may be noticed in the Fall, but egglaying usually only takes place during the earlier parts of the year. The male will approach the female, bobbing his head vehemently. The female usually will attempt to move away from the male, forcing him to follow her. When the male finally corners the female, his head bobbing will increase, and he will begin circling the female, biting her head and forelegs. The male will then begin pushing into the female, forcing her to withdraw into her shell. When the female becomes quiescent, the male will mount. Like other tortoise species, the male desert tortoise has a concave plastron that allows him to effectively mount the female and hold his position. Oviposition occurs 25-40 days after copulation. The best method of ensuring that the eggs are safe is to artificially incubate them. Watch the female tortoise closely, when she is getting ready to lay she will look around the yard for a suitable nesting site. When a suitable site has been found, she will excavate a chamber 6 to 8 inches (15-20 cm) deep and deposit her eggs. The female may cover her incubation chamber will earth, effectively camouflaging its position, so it is important to note where in the yard the female has chosen to nest. The size of a clutch and the number of clutches per years depends upon both the age of the female and the nutritional quality of the diet. There have been reports of clutch sizes varying from two to fifteen eggs, with as many as three clutches a year possible. After the female deposits her eggs, dig them up and place them in an incubator. 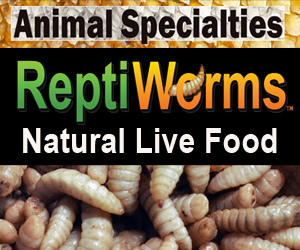 Egg incubators can be home constructed or purchased from reptile specialty companies. Chicken egg incubators found at feed stores may also be used, but it is essential that the temperature and humidity be monitored carefully, as these incubators tend to desiccate even hard shelled reptile eggs. To increase the airflow around the eggs, they should be placed in an open container in the incubator, and the incubator should be opened once a day to flush out CO2 buildup. There is evidence that the practice of incubating chelonian eggs in sealed or almost sealed containers contributes to increased "death in the shell" occurrences and premature emergence of hatchlings (Highfield, 1993). Temperatures for egg incubation can range from 84-88 degrees F (28.8-31.1 degrees C), with an average of 86 degrees F (30 degrees C) preferred. The easiest incubation media to use is slightly damp vermiculite. High humidity is not critical for the hard shelled eggs of desert tortoises, and may in fact be detrimental by encouraging fungal and bacterial growth. The humidity in the incubator should be maintained between 50 to 70%. Desert tortoise eggs incubated within the ranges specified hatch in an average of two and a half to three months. Some eggs may take as long as 170 days. A good rule of thumb with tortoise eggs is: if the eggs look good, leave them alone, even if they are taking forever to hatch. 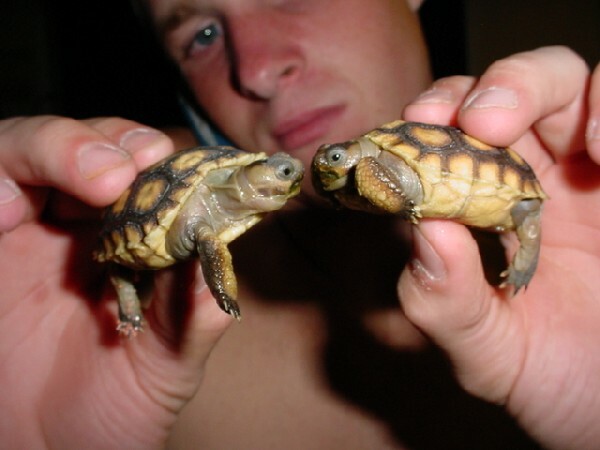 The hatchlings can be set up in the vivaria described earlier, or outside in a tortoise pen. Hatchling desert tortoises can be fed the same diet as the adults, as long as care is taken to chop the food into small pieces. To find out about the specific laws concerning the captive born progeny of legally acquired desert tortoises in your state, contact your State Game and Fish department. Although desert tortoises are federally protected and cannot be taken from the wild, adoption programs do exist to place captive born offspring and tortoises displaced by development into captive homes. If properly cared for, a desert tortoise pet may well outlive its owner. The longevity of desert tortoises may tempt some individuals to release a captive tortoise into the wild if they no long can or wish to care for it. Releasing captive desert tortoises into the wild should not be done under any circumstances in order to prevent the spread of URTD, inappropriate genetic mixing, and the release of tortoises into unsuitable habitat. Desert tortoises, with their ability to tolerate long periods of water and electrolyte imbalance, are among a unique group of animals adapted to the hostile climatic extremes of the North American deserts. Adopting a desert tortoise allows for a glimpse of the ecology that keeps these deserts alive, and is an educational experience for the entire family. I would like to thank Vanessa Dickinson for editing the manuscript, providing photos, and for providing invaluable assistance and encouragement. I would like to also thank David Peters for editing the manuscript, and Bob Miles for photo contributions. Berry, K. H. 1984. Appendix 1. "A description of forty-seven study sites for the desert tortoise in California, Nevada, Utah, and Mexico". pp. A1-40 In: K.H. Berry (ed. ), The status of the desert tortoise (Gopherus agassizii) in the United States. Desert Tortoise Council Report to the U.S. Fish and Wildlife Service on Order No. 11210-0083-81. Brown, M. B., E. R. Jacobson, I. M. Fuerst, and P. A. Klein. 1992. "Mycoplasmal respiratory disease: overview, similarities, and potential lessons for upper respiratory tract disease in the desert tortoise". Proc. Symp. Desert Tortoise Council. 1992:8-9. Highfield, A. C. 1993. 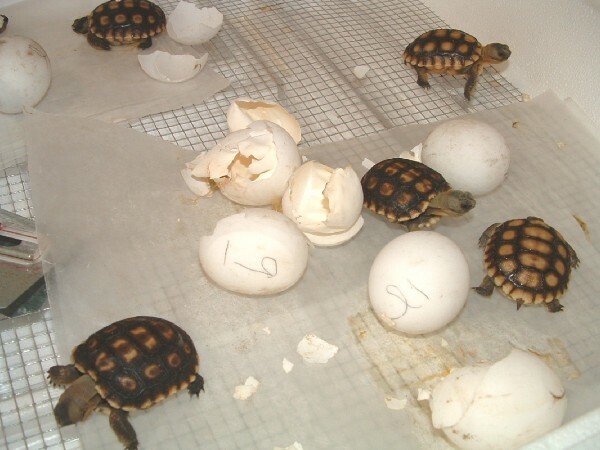 "An effective method of artificial incubation for Mediterranean tortoise eggs". The Vivarium 5(1):15-17. Jacobson, E. R., J. M. Gaskin, M. B. Brown, R. K. Harris, C. H. Gardiner, J. L. LaPointe, H. P. Adams, and C. Reggiardo. 1991. "Chronic upper respiratory disease of free-ranging desert tortoises (Xerobates agassizii)". J. Wildl. Dis. 27:296-316. Luckenbach, R. A. 1982. "Ecology and management of the desert tortoise (Gopherus agassizii) in California". In R. B. Bury (ed.) North American Tortoises: Conservation and Ecology, pp. 1-37. U.S. Department of the Interior Fish and Wildlife Service Wildlife Research Report 12. Washington D. C.
Messonnier, Shawn. 1995. "Current controversies in reptile medicine-green iguanas". 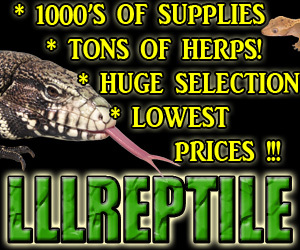 Reptile and Amphibian Magazine. November/December 1995, pp. 49-57. Stebbins, Robert C. 1985. A Field Guide to Western Reptiles and Amphibians 2nd ed. Houghton Mifflin Company. New York, New York.